My Fifteen Minutes of Fame at the Book Signing! 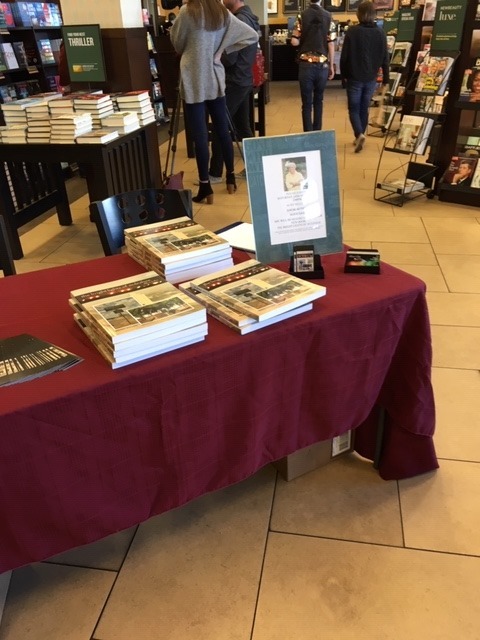 Last Saturday I had the pleasure of hosting a book signing for The Bright Lights of Muleshoe at the Barnes and Noble store located in the South Plains Mall in Lubbock, Texas. The store’s Community Business Development Manager, Terry Handley, worked with me to organize the signing; media consultant Kim Davis, president of Nomiss Communication in Lubbock, was in charge of publicity for the event, and did a banner job of distributing press releases, contacting local television stations about the big day, and creating interest by sharing copies of the book with her business networking group, Business Networking International (BNI). Kim had mentioned notifying the television stations, but what a surprise to me when here they came! 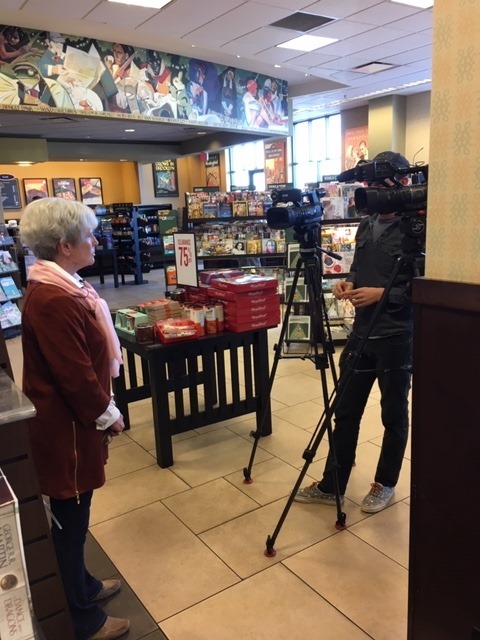 Thank goodness the young people behind the cameras knew their jobs well and fed me good leading questions to answer; otherwise I might have come across something like Elmer Fudd! 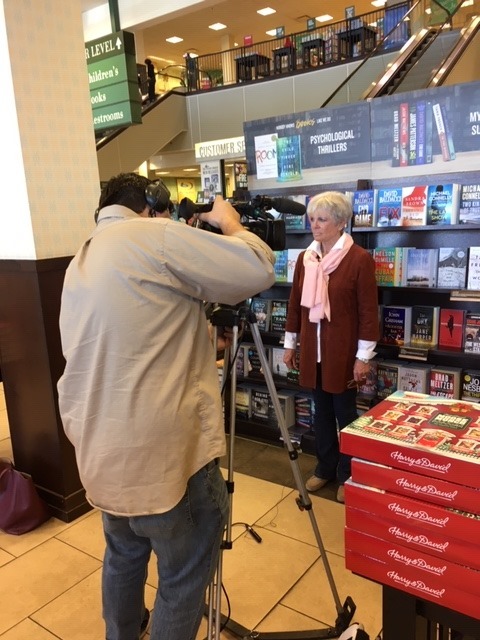 After the camera crews left, it was time for the book signing to begin, and I look up to see two familiar faces, Tom and Jacque Boutell from Muleshoe! 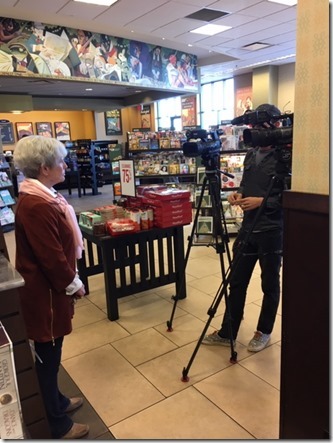 And while the people who were kind enough to stop and buy the book or just stop to talk, were not all from Muleshoe, it was interesting how many had some connection to Muleshoe. And I suspect seeing the name Muleshoe on the posters and book covers is what lured them over to the table in the first place. I even had one former student buy a book, Charla Holt Cogdell, who now lives in Lubbock, and that was fun. Tommy and Jan King, friends who moved from Muleshoe to Lubbock, stopped for a book and Jan took a picture of us and posted it on Facebook, which garnered many positive comments, and I appreciated that bit of publicity connected to the event. I did keep a list of all who bought copies of the book, but looking back on it now, I almost wish I had taken better notes and a picture of all who bought the book, but I was having such a good time just talking to everyone, I didn’t even think about it. And that would have been just a bit much anyway; people didn’t come to have their picture taken; they came to buy a book. And for that I am grateful. I had taken two copies of the book to the Southwest Collection on the Texas Tech campus earlier in the week and had met Austin Allison who works there. He is the grandson of Jean Allison, with whom I had taught at Muleshoe High School and who taught my children. I was pleased that the book was deemed of appropriate quality and subject matter to be accepted to the research library, and Austin made me aware that the Muleshoe newspapers are now on file there in digital format. Now I know I can access the library from my computer when I need to research a story. So I was pleased when Jim and Nancy Allison, Austin’s parents stopped by for a book for themselves and for Jean, who now lives in San Antonio. And Jean is in the book! The day went well, but by 6 o’clock the cold air was creeping in the front doors, traffic had dwindled, I was cold, and it was time to go home. Besides, my curiosity, not to mention vanity-ha!- insisted I make it home in time to watch my TV interviews, because all four would be slightly different, on all four Lubbock stations. What a deal! I set my TV to record two channels, which is all I can do at once on our system, and which won’t allow me to watch other channels while these are taping. I then parked myself in front of one of our other TVs without the recording box and flipped back and forth between the other two channels that I didn’t have recording. And there may have been a better way to capture all four stations, or at least watch them easier, but I didn’t know how to do it. Not that tech savvy; old person and all that, but I did manage to watch the majority of those two interviews. And of course, after watching, all I could think about was what I might have said instead of what I did say, which I suspect, is what happens with most impromptu interviews. At least that is my story and I’m sticking to it. But people have given me positive feedback, and I appreciate that. So for a day I did enjoy Andy Worhol’s prophetic fifteen minutes of fame The interviews are old news now, but the book lives on and is still for sale and the interviews did get the word out about it, so time will tell how long the effect lingers. And if you missed my Oscar-worthy performance, the recordings will remain on my TV for a lot more than fifteen minutes if you care to come by and relive the moment with me. Or just talk. I always enjoy a visit. My thanks to Terry Handley and Kim Davis for making this all happen. I love your book and I’m glad you are getting such positive response with it. Thanks so much, Mary. Everyone really has been supportive of my efforts.